base price: $2.16 / Stk. 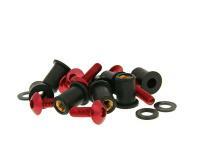 Red anodized aluminium allen bolts, great for bodywork parts, foot boards etc. Cheese head bolts, 16mm in length, M5 thread.